The production, directed by Barry Matthews-Keel, commemorates the 400th anniversary of William Shakespeare’s death in 1616. A Midsummer Night’s Dream is a classic Shakespearean comedy with love stories confused by mistaken identity, in this case, caused by some mischievous fairies. Mark Honan brings life to the scenes where the players are rehearsing and performing with his excellent comedic performance as Bottom. The star of the show is certainly Martha Osment who gives a fantastically playful performance as Puck. Her characterisation of the cheeky fairy is spot-on and really leads the way for all the other fairies. 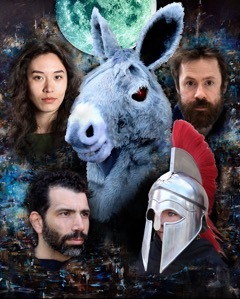 THERE are so many good ideas in Barry Matthews-Keel’s production of Shakespeare’s magical comedy a Midsummer Night’s Dream, on stage at the Studio Theatre in Ashley Road, Salisbury until 23rd July. It starts in total darkness, and as the light comes up a silhouette begins a slow martial dance. We discover that she is Hippolyta, soon to marry the Athenian duke Theseus, and she is in stylish armour, making sense of how the Duke conquered her in battle and then in love. Movement is a very very large element of this production, and since no choreographer is credited, I assume that Mr Matthews-Keel and his assistant director Rowena Greenaway were responsible for it. The Shakespearean themes are of romantic love, jealousy and magic, and the play gives opportunities for all sorts of invention. Here the set was cleverly lit to enhance the fairy glade, but the central structure was not only versatile but a bit vertiginous, and slippery, for the cast. The soundscape, with kora music for the fairies and impressive storm effects, all added to the atmosphere, and the costumes, especially the fairy garments, were a delight. As always with the talented Studio Theatre company, there were excellent performances, notably by Stan Morris as Lysander, James Patterson as Oberon, Lorna Matthews-Keel as the newly created Lead Fairy, and Mark Honan as Bottom. This entry was posted on July 24, 2016 by salisbury_matt in reviews.